It often surprises me when people ask if there are Trout in Italy; well, there are a bit more than you think. The Italians are a little short-on when it comes to bulk rivers but what they have, they love. I think you will find the following story amazing at just how good it can get on some waters north of Tuscany and if you are ever over that way, don't leave that fly rod at home. The following notes are from my dear friend Roberto Nera who invited me for fishing on the beautiful Mastallone River in Italy. 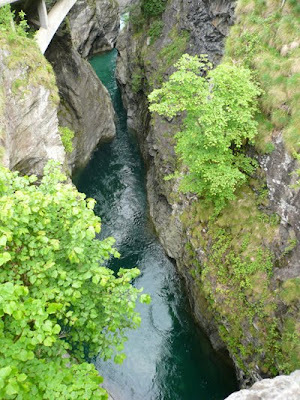 We had great fun together fishing for some days here; great fish and fights with Trout and Dolly Varden. I want to thank Roberto for giving me the opportunity to be his friend. 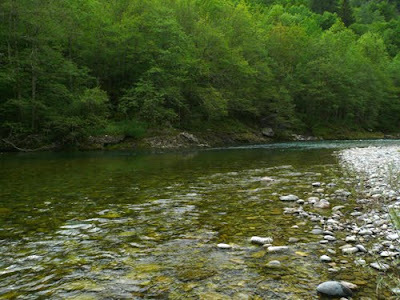 The Mastallone River is one of the best rivers for fly fishing in the North of Italy. It flows from the Monte Rosa mountain group in the wonderful Val Sesia valley. The history and tradition of flyfishing in Italy was born in this valley many centuries ago. The traditional fly fishing style here is very old and in particular, the anglers here used long bamboo rods with no reel and long braid lines made with the tails of male horses. The flies used here are also very special ones, generally spider flies tied in red, grey, yellow and purple colours with a soft hackle of partridge or nocturnal birds. For many centuries the fishermen of the Val Sesia valley have caught grayling, brown trout and big marble trout this way and until today this flyfishing traditional style still survives. 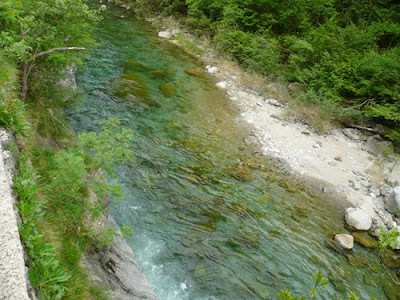 Some years ago two fly fishermen friends, Roberto Nera and Marco Feliciani, with local Consorzio della Val Mastallone, started the management of part of the Mastallone River, named "La SELVA" Reserve. 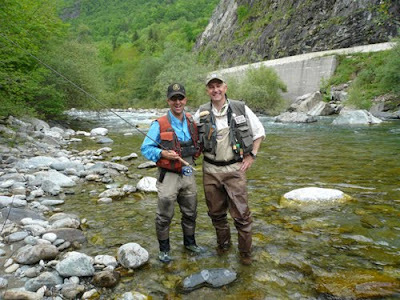 With their flyfishing experiences and the knowledge that they have gained around the world, the two friends saw the possibility to create in Italy something similar to the more famous Slovenia or Austria reserves where the fly fishing tradition is deeply embedded in their history. 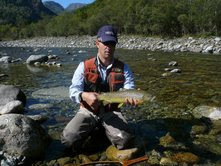 In the Mastallone River there is a large population of brown, leopard, rainbow and big marble trout. 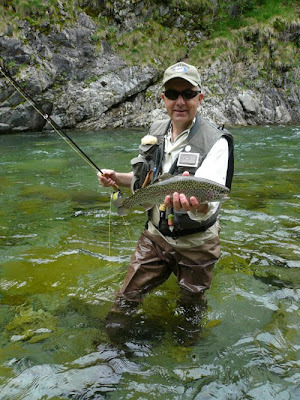 There is also the presence of some grayling that are believed to move up from the Sesia River. Every year the river is stocked with trout from selected farms. The future project is to stock the river only with wild trout progeny collected from this source. These fish will be harvested at a new hatchery, created especially for this purpose, in the valley. The Mastallone is a fantastic alpine river characterized by runs and deep pools with the presence of various insects and during the year it's easy to see many big hatches of mayfly, caddis and stonefly. 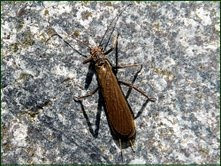 Particular attention must be given to the stonefly hatches between May and the end of September. 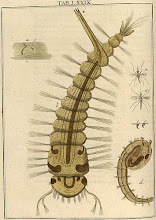 There are particular hatches of the large stoneflies, called by the local angler in dialect language, "Stavacche". These big flies characterize the fishing in the river, with the possibility to catch big trout on large dry flies, attractors like stoneflies, stimulators and big terrestrials. Fly fishing is also very good with spiders and dry flies during the ephemera hatches and the pale grey and light olive colours are the most successful choice for catching trout. Nymph fishing is also very successful here, with the use of large nymphs during the spring season, gradually reducing the size to small ones in the summer and fall seasons. 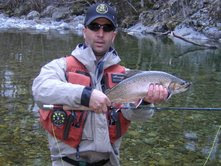 Streamer fishing is also very productive here, especially with little dirty water and it's possible to catch the large marble trout that stay in the deeper pools and under the big rocks. 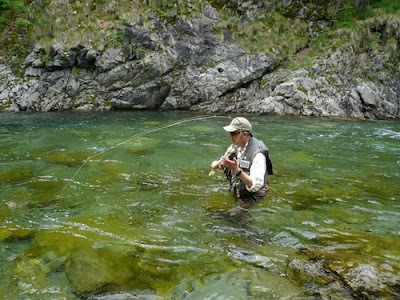 The Mastallone River gives the fly fisherman the opportunity to use all the techniques that he prefers, passing from one to another during the day. The valley is not only interesting from a fishing point of view, in fact there are many beautiful places under the mountains and small villages to visit, where many typical restaurants give the fisherman the opportunity to eat typical genuine food and drink a very good red wine. 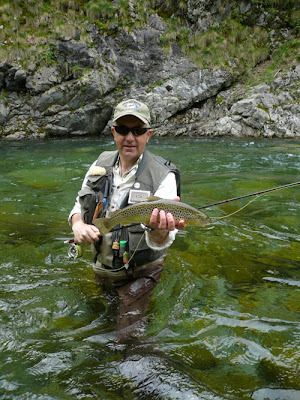 The Mastallone River is easy to reach from Milano and Torino and gives a great opportunity to a fly fisherman visiting Italy to have good fun and relax, fishing to large trout in a wild valley with a very long fly fishing tradition. 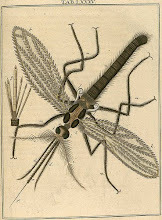 Many years ago I purchased a sixth edition of The Fly-Fishers' Entomology, Alfred Ronalds, 1862. 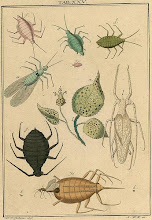 The reason I was keen to pay around one hundred dollars more than its market value at the time was because secreted between its pages were three very old flies. The book store owner, whom I knew well, told me that the history behind the flies was that they were placed in the book by its original owner and they were very old then. Well, that is the story from the family who owned this book when they sold it off with a number of other works at the time. The story they told was that their Great-Grandfather brought it out from England in the very late 1800s and it had been handed down to them. Good salesman, or a true story, I don't know but those flies had been sitting in that book for a very long time. You can easily see the rust and gut impressions they have left on the pages. 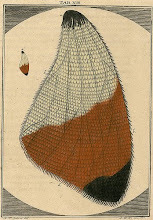 Take note of the bottom fly, No.31 Dark Mackerel, as it is not unlike one of those set between these pages. Can you just imagine how that old fly tyer would feel knowing that his flies are now featured on a website in Australia nearly two hundred years or more after they were tied? Just think of the things he would not know about; Websites, The House of Hardy, Graphite fly rods, breathe-able waders, plastic bags or mobile phones, or telephones for that matter and on that list would go. But I think the first thing that would come into his mind is that he must have tied them well to last so long. I suppose the reason for posting this topic is to see if there is any older out there. 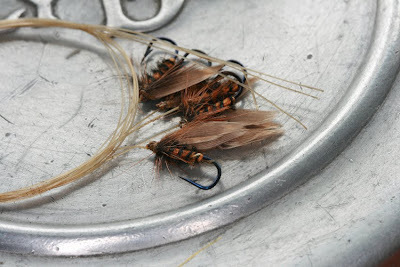 At a guess, by the style of the tying, I would say these flies were around the very early 1800s, maybe even earlier. The big question is; if you have older, please forward a picture and I will gladly post it on this blog.